April 9 marks a big day for Cube Entertainment and its artists, as the entertainment company achieves a new milestone, being officially listed on KOSDAQ today. Cube Entertainment’s artists made an appearance headed by CEO Park Chung Min for the listing ceremony today, with attendees including 4MINUTE, BEAST‘s Doojoon, Hyunseung, Kikwang, and Dongwoon, G.NA, Roh Ji Hoon, BTOB, Shin Ji Hoon, CLC, Kim Kiri, and newest actor addition Nah Jong Chan. CEO Park also expressed his gratitude to Cube’s chairman Hong Seung Song in his speech for the company’s growth and his dedication in bringing the artists and employees together. As of now, YG Entertainment has the highest stock value of 48,750 won per share with 14.5 million shares outstanding, while SM Entertainment 34,350 won per share with 20.51 million shares outstanding. FNC Entertainment, home to FTISLAND, CNBLUE, AOA, Juniel and more, was also reported in October last year to join the big three companies to be officially listed on KOSDAQ. Founded in 2008, Cube Entertainment finally joins in with a moderate start of 3,880 won per share, and will start to compete against JYP Entertainment which lists 5,610 won per share for 31.48 million shares outstanding, and FNC Entertainment with 23,350 won per share for the 5.16 million shares outstanding. A recent television program discussing stocks and issues also pre-revealed the next steps of Cube Entertainment, listing possible comeback and concert schedules for its artists, and highlighting the company’s intention to not just target the Japanese and Asian markets, but also to expand to the Chinese market through partnerships with Chinese companies. With the merging of Cube Entertainment and Woori Special Purpose Acquisition 2 Co., Ltd (Woori SPAC II) for Cube’s official listing today, there are hopes for the label to venture overseas with the earnings. Cube is aiming to raise the current 20% of sales from overseas markets to 30%. 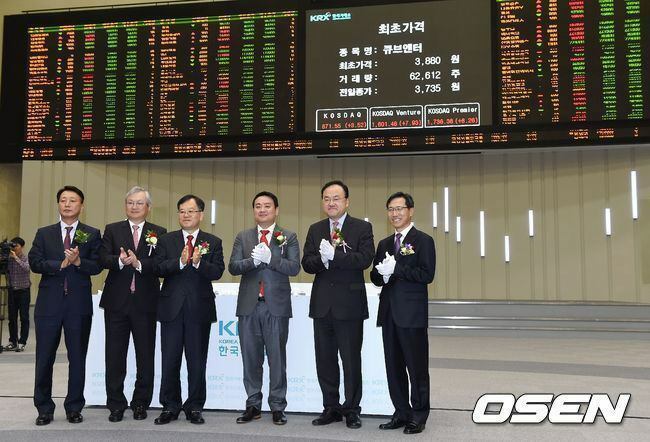 In particular, with the official KOSDAQ listing, Cube plans to use 16 billion won worth of earnings to enter the Chinese market and expand their offices there. For last year’s sales, BEAST attributed to 54% of total sales, 4MINUTE 15%, BTOB 9% and G.NA 3%. For the third and fourth quarter last year, Cube Entertainment received 14.2 billion won in sales, with profits of 1.8 billion won, and net income of 1.3 billion won. This year’s earnings have been greatly attributed to sales from the Japanese and Chinese markets, with estimated profits of 5 billion won and net income of 3.9 billion won. Kim Soo Hyun is to return to the big screen with "REAL"